While crossing the Sinai Peninsula, we stopped at St. Catherine’s monastery at the foot of Mt. 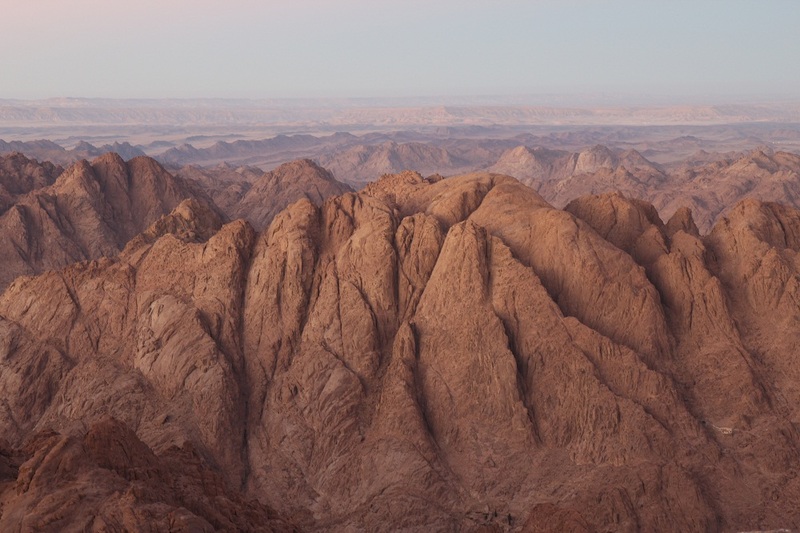 Sinai, the mountain where God gave Moses the ten commandments. The burning bush, the rock which produced water for Moses, and the well where Moses met Zipporah, his future wife, are all conveniently located at the monastery. It was surreal to gaze upon these things and wonder if the bush and rock truly were touched by the divine. Mt. Sinai, also known as Mt. Horeb, and Mt. Musa (Moses), is a very popular place to watch the sun rise and set. Sunrise tends to be more popular, with thousands of people making the few hour hike in the middle of the night in order to arrive just in time to praise God as they watch the sun rise over the Promised Land. We were lazy – not to mention, the nights were super chilly – so we opted for the sunset. The desolate yet beautiful landscape, with its barren peaks and valleys, was unlike anything we’d laid eyes on before. I couldn’t imagine people wandering this bleak wilderness for 40 years! It was surreal to follow in Moses’s footsteps, to think of him having climbed the very same mountain, the mountain where God revealed himself and handed over his law. As we looked out over the Promised Land and later descended the mountain under the magic of a lunar eclipse, my thoughts were with my Grandma Berry, who had passed on to the heavenly Promised Land two days before. When I said goodbye to Grandma this past spring before we left, she was weary and had just enough energy to open her eyes and take me in. “Pretty girl,” she told me, and went back to sleep. For a Grandma always full of kind words, it was only too fitting that the last words she would share with me were complimentary and full of love. Grandma was a little bit of a thing, full of spirit, love, and contentment. When she would share stories about her life, especially about being a mother, over and over again she would exclaim, “I’d do it all over again.” I pray that when my homegoing day arrives, I will share in Grandma’s deep satisfaction and joy in a life well lived. Written by: kate on December 11, 2011.on December 30, 2011.